LIQUID BIOMASS POWER GENERATION Outline｜NANOFUEL CO., LTD.
Renewable energy by the nature force is now attracting attention in Japan due to the influence of the nuclear accident. Among the renewable energy, biofuel which is least subject to nature gathers great attention since clean and stable supply alternative to fossil fuel is expected. The idea of the Nano-biofuel is totally different from the conventional biofuel and is to supply crude plant oil directly to diesel engine by low-cost processing without passing through complicated chemical process of manufacture. Biomass power generation has been made all over the world, but most of its stuff is solid biomass such as rice straw, cotton, wood, rice husk, etc., there`s no one using the liquid biomass. Crude plant oil is a liquid biomass which is intended for diesel engines, while it`s difficult to be used directly as a fuel therefore it requires refining and processing by a complex process. For this reason, it was not possible to use it for power generation by increased cost. By fully utilizing unique Nano-technology, our company has achieved efficient elimination of phosphorus and significantly improved flammability. We`ve successfully developed “Nano Bio Fuel” which can be directly supplied and used as a fuel for large and medium-sized diesel engines. We are developing world first “Liquid Biomass Power Generation” and electric power selling business. ■　Only by adding our Nano-Bio fuel manufacturing system to the existing diesel power plants, so-called liquid biomass power generation is available using plant oil as a fuel. ■　Since liquid biomass power generation is renewable energy, it is CO2-free, thereby contributing significantly to the CSR. 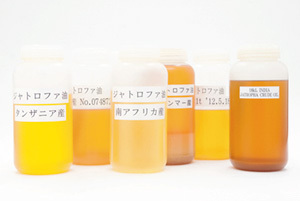 ■　All plant oils (edible, non-edible), waste cooking oil is usable, however at the time being we use crude palm oil. Crude Palm Oil is the world's largest output and it is possible for stable procurement. ■　The equipment utilization rate is up to 70%~85% which is comparable to about 6-7 times that of solar power. ■　Fewer constraints on location requirements of the power plant, if clear environmental regulations, it can be constructed wherever of the whole country. ■　Compared to other renewable power generation, it requires less capital investment per unit of output. Even taking the equipment utilization rate into consideration, it is about 1/12~1/15 degree of solar power generation. ■　Preferential taxation is applied on capital investment especially for Japan domestic customers, and the customers take either merit of immediate depreciation or the tax credit. A major domestic engine manufacturer received the request from European users who "Hope to use crude plant oil directly as a fuel", subsequently they asked us for technical development. Joint development began from here. The necessity of the development is further authorized, adopted as a NEDO project（New Energy and Industrial Technology Development Organization, also known as NEDO, is Japan's largest public management organization promoting research and development as well as deployment of industrial, energy and environmental technologies.）. In response to this, both Fundamental & Practical use research and development have been completed successfully. Representative examples of biofuel include BDF and bioethanol, but both are alternative fuel for dynamic body, such as automobiles. BDF is also applicable to diesel engines, while it is not realistic as for its high price due to its manufacturing process is complex. In addition to being expensive, with only 1/2 the calorie of petroleum, bioethanol is difficult to be used for large and medium-sized engines which require a large output. On the other hand, unburned residual substance adheres in cylinders and leads to a stop in a short term if supply crude plant oil directly to diesel engines. The reasons subject to, (1) Phosphorus contained in crude plant oil forms a salt and solidified, (2) Crude plant oil performs poor combustion due to high viscosity, high boiling point, low evaporation characteristic. We`ve solved these problems by making full use of nanotechnology, and succeeded in conversion of crude plant oil to fuel. The use by the diesel power generation is enabled in this way.